Lei’Ohu Ryder and Maydeen Kuuipo Iao (Hawaii, USA) are spiritual leaders, visionaries, healers, singers/songwriters and educators. They are emissaries of “aloha” and advocates for the indigenous soul in all people, blind to the labels (race, creed, nationality, ideology, etc.) that separate us from experiencing the true nature of our selves and others. Their love and knowledge of Na Mea Hawaii help us to connect with ourselves, with spirit, and to be pono (balanced in right alignment). 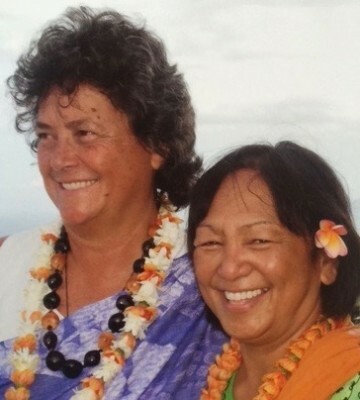 Lei’ohu and Maydeen offers their gifts throughout the world with Aloha. Their talents and knowledge are honored and loved in their community and the world. Their work has been recognized by the Office of Hawaiian Affairs, Peace Corps, Sierra Club and the United Nations. Lei’ohu was awarded the Gandhi-King Peace Hero Award in 2002.